Join OAC members at our next meeting! Mark your calendar for our August 14, 2019 meeting which will be held at the beautiful Mission Oaks Gardens in Zanesville. The meeting will include time for networking, OAC business, education, and a tour of the gardens! It is certain to be a delightful day in the heart of Ohio's Appalachian Country! We hope that we see you there!! Winding roads, rolling hills, rivers and creeks, plus some of the best food in the Midwest - it can all be found in Ohio's Appalachian Country. This 32 county region spans from Ohio's southwest corner all the way up to it's northeast corner, following the Ohio River. Appalachia offers many attractions for the traveler- captivating landscapes, sparkling waterways, abundant flora and fauna, internationally-acclaimed music, unique arts and crafts, a rich and compelling history, and much more. But perhaps the Appalachian Region's most vibrant and sustainable resources are those pertaining to food ans agriculture-bountiful local farms, lively farmers markets, farm-to-fork restaurants, inventive chefs featuring local ingredients, delightful vineyards, and award-winning wineries, craft breweries and distilleries, heritage food festivals, and other distinctive culinary events. Here you can experience the authenticity of Appalachia at its most intriguing. This map celebrates one of the most exciting and innovative culinary destinations in the world. It serves as an introduction-a taste- of Appalachia's distinctive local food destinations and the farmers, food producers, chefs, and entrepreneurs who have committed themselves to local food craft and tradition, Bon Appetit Appalachia! To plan your Bon Appetit Appalachia tour, visit: www.visitappalachia.com. 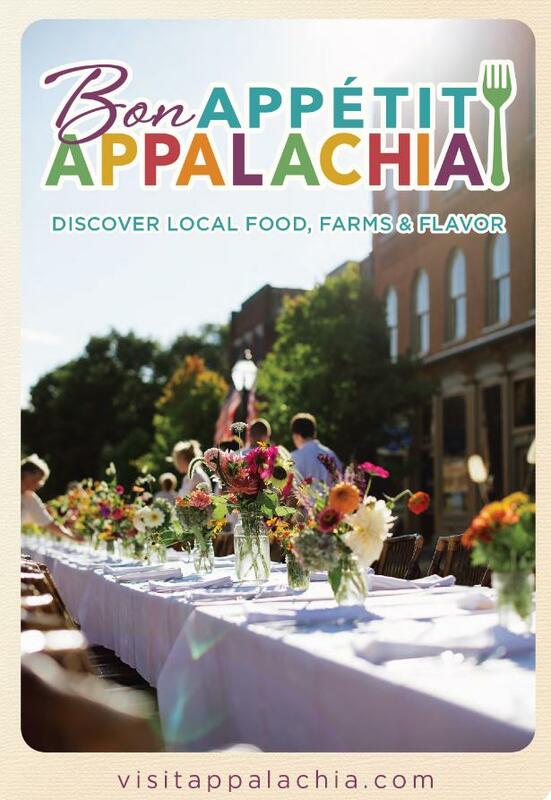 The Bon Appetit Appalachia map is available hard copy in the summer Edible publications and throughout Ohio's Appalachian regions in our Convention and Visitors Bureau's offices. Be certain you don't miss our vibrant and bright Bon Appetit Appalachia experience! In recognition of the 150th Anniversary of the Civil War, American Heritage Magazine and the Appalachian Regional Commission's Tourism Council developed a magazine feature and interactive website to explore the unique Civil War stories and sites of the nation's Appalachian Region. Click on the photo to explore VisitAppalachia.com.